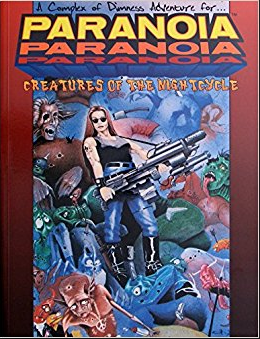 Okay, so we wrote “The Longest, Deadliest Paranoia Adventure Ever,” which sounds impressive and all, but there’s something you should realize about Paranoia. Normal gameplay is so full of dying Troubleshooters that any adventure billed as “the longest ever” is very likely to top the others. That’s not to say we didn’t put in a little extra effort. There’s one scene where the GM is encouraged to demonstrate how many enemies the players face by foregoing the usual miniatures and instead whipping out a half-pound bag of Skittles to be dumped on the gaming table. If the Players weren’t vamp-clones that regenerated and had six spare lives, the adventure would be unplayable. Do I have regrets about this beast of an adventure? Oh, boy, do I ever. There’s a point where we violated what I consider to be the #1 rule of published adventures, which is never to say “eh, you’re a GM, just improvise.” To which the GM should rightly respond, “Yo, [BLEEP], I didn’t just drop a $20 at my local gaming store for you to tell me to improvise.” The interior layout makes the text hard to read, the cover has little to do with the adventure, et cetera, et cetera. But playtesting this one was kind of a blast. If Die Hard is sadistic for taking away the hero’s shoes, we are doubly sadistic for taking away a hero’s shoulders. If that doesn’t sound so bad, imagine the problem if you are in a roller coaster-like vehicle as you are transported on a literal railroad to the next plot point. We mocked White Wolf’s “World of Darkness” in many ways, but of course it was the mockery of someone who has played and loves their games. Creatures of the Nightcycle is available here or here.